View the summary of our current activities and subscribe to our newsletter to stay informed. We designed the industrial open-space offices as customised premises for the digital agency X Production. A photo-shooting studio, an essential component of the work of this company, is part of the premises. 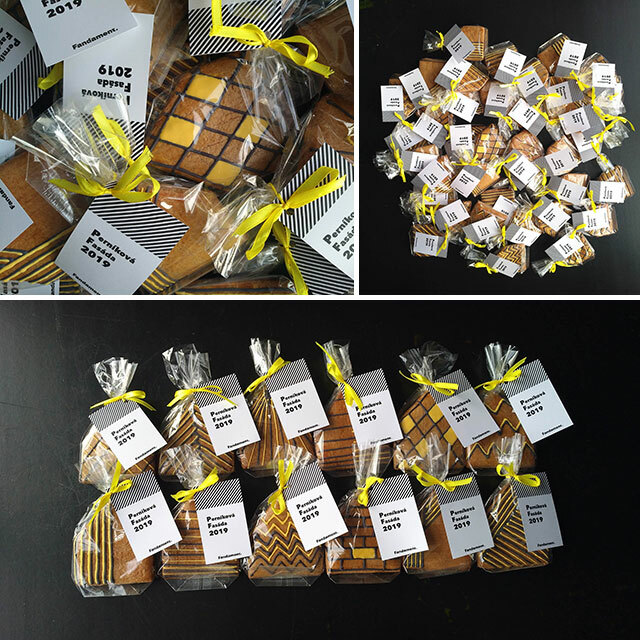 A happy new year and please accept our 2019 Gingerbread Facades! 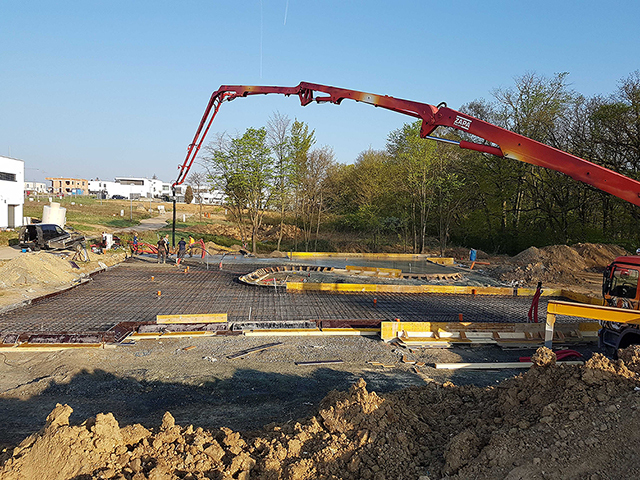 The villa construction is under way and the building is receiving its shape. Soon it will look like in the rendering. A house with a five-colour facade, mirroring the surrounding landscape, with additional yellow accents of protruding mass. The study of the apartment building was completed. Construction is in progress. 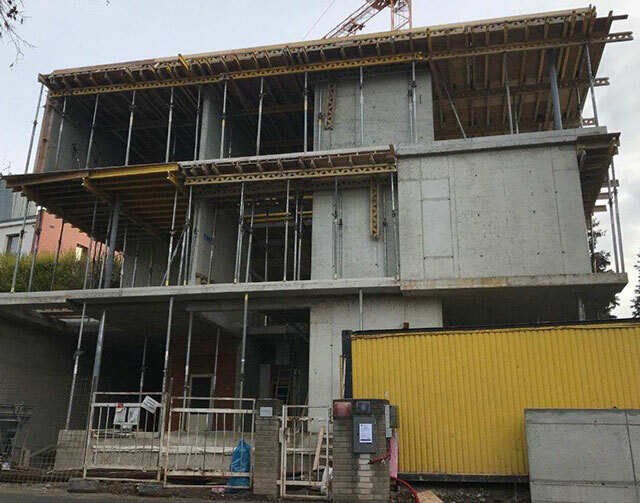 The shell and core and skylights are completed, frames for arched windows are being mounted, concrete for the lake in the atrium is being poured, a roof leak test is being performed and plumbers are preparing their pipes… business usual, you know it. Villa Puzzle. The owners have already moved in this wooden home with a saddle roof. This beautiful chalet surrounded by nature is a haven outside the city. The complicated foundation situation resulted in a high retaining wall. We will of course keep you posted about the latest development. The villa sits among architecturally significant villas from the 20th century. It was a challenge to design a new building in such a development but we are extremely satisfied with the result. We have completed the study for Villa Jin Jang. The structure is located in a beautiful environment and surrounded by meadows and a forest. The ring symbolic. A house and a lake like two droplets. 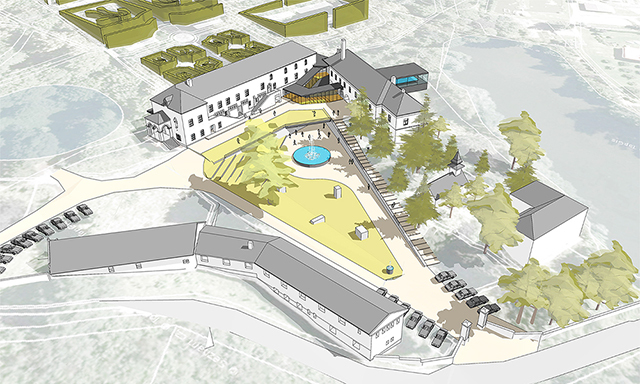 We were pleased to hear that the investor wishes to continue with this project. Villa Puzzle is already under construction! The houses are similar, but each of them is different. Together, however, they constitute one company entity. Reference to a traditional stone house is very typical of this location. And a sea view, many nice corners and places are a must as well. 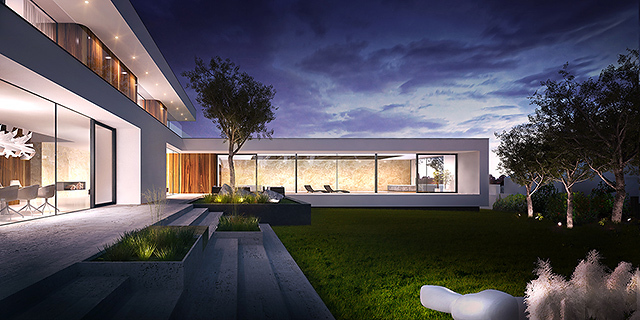 The composition of two houses emerged on the edge of Prague on a land plot facing the surrounding landscape. 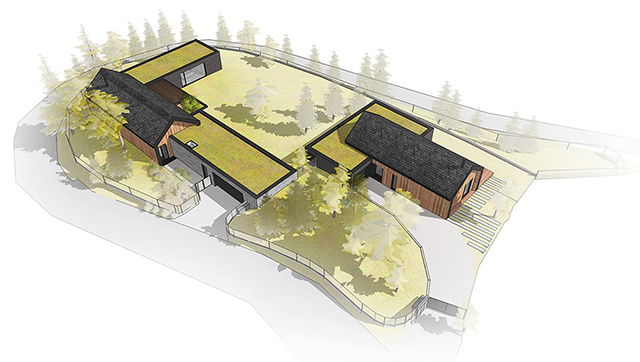 A combination of a saddle roof, surface-burnt timber and slate. The structures literally grow from the ground. No matter where inspiration comes from, it is never the copy for the resulting design. Each house is an original and this is how we approach it. We create a new story: this time it is Villa Jin Jang. It is always exciting to watch the construction and see the future shape emerging. 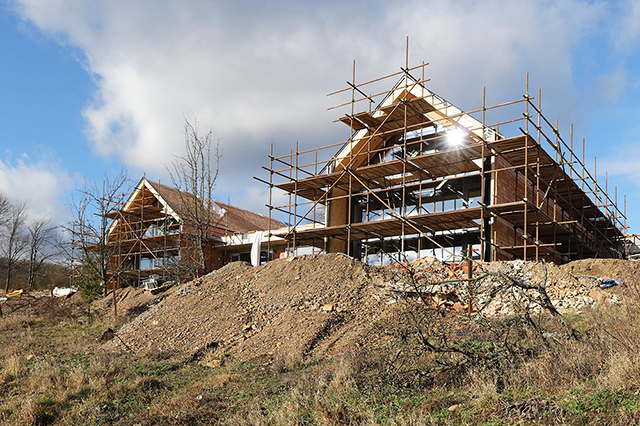 Chalet Karlov has already received its shingle roof and glazing has been installed. 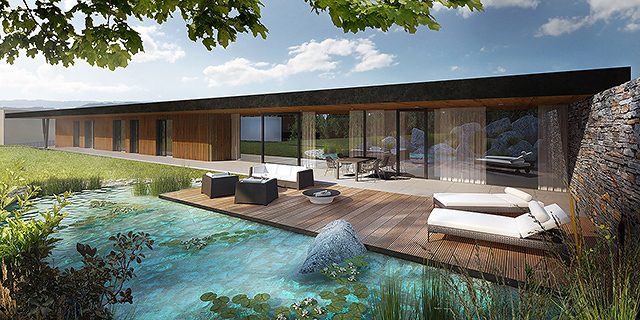 Our portfolio of homes located outside the Czech Republic has been extended. We are starting with the study of three homes in Croatia for holiday purposes but also all-year use. Each home offers privacy and its own sea view. We have completed the study of Villa Meina. 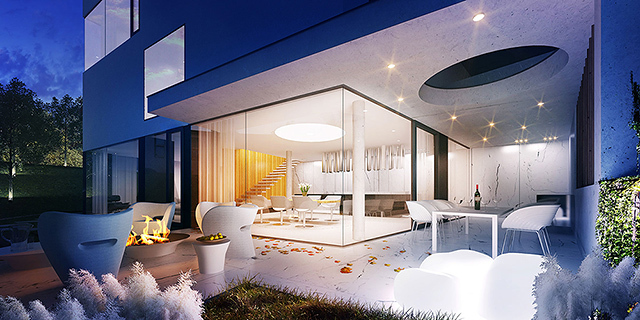 The terrace-based concept of this residence with a view of the Lago Maggiore lake translates into the layout and functional aspect of the building. Villa Moises will soon see its residents. 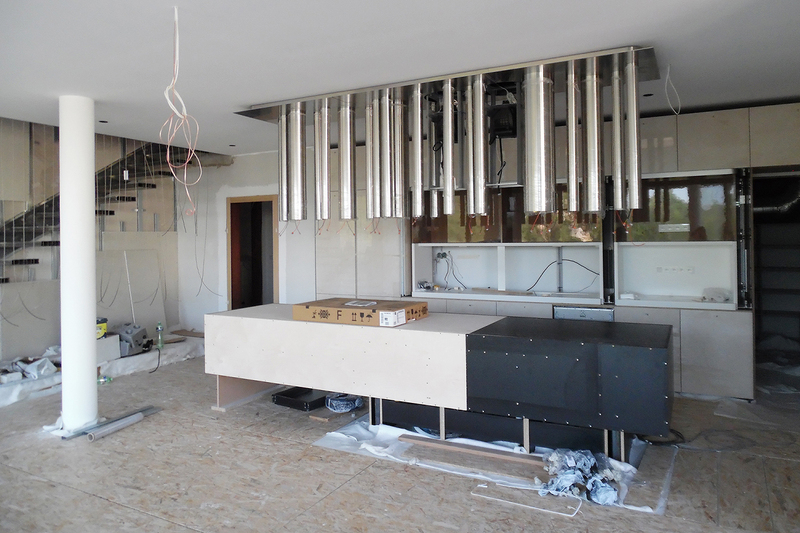 A photo of the interior and the unique solution of the extraction hood above the kitchen island. 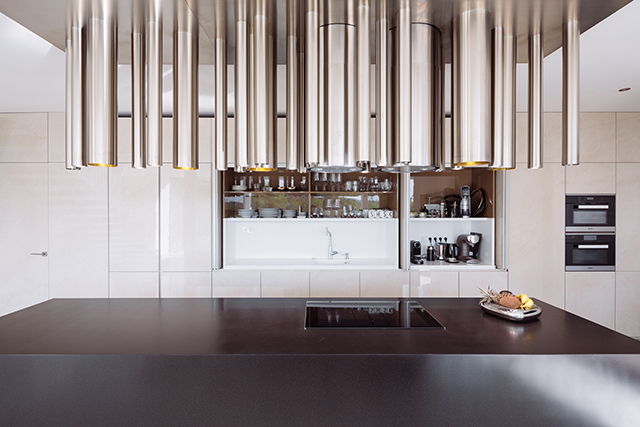 The stainless organ does not play, but illuminates the space and extracts air. 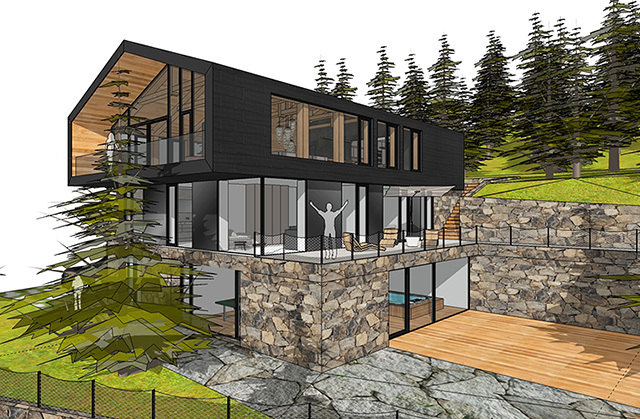 We are the architect of building upgrades of a mountain cottage in Špindlerův Mlýn. 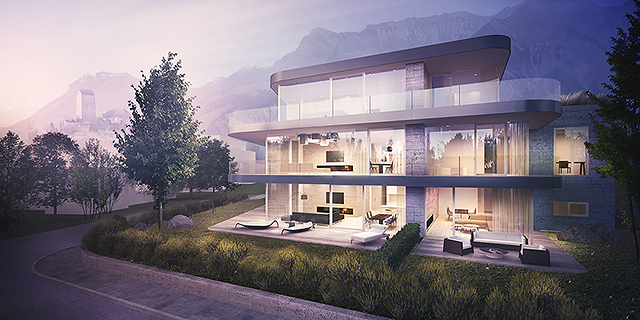 The final shape and inspiration by a mountain chalet match the vision of the investor. 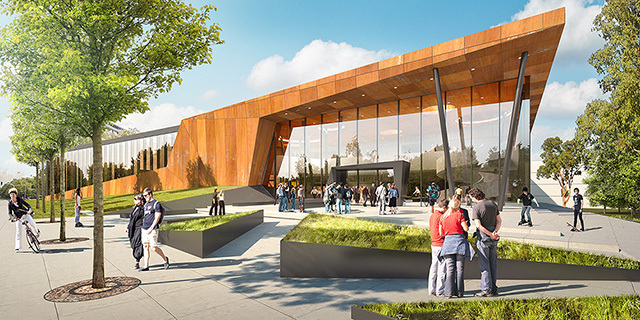 This mixed-use hall for a wide range of sports activities offers more than just local and regional events. It is a simple block recessed into the ground from the street side. We are finishing one study after another. 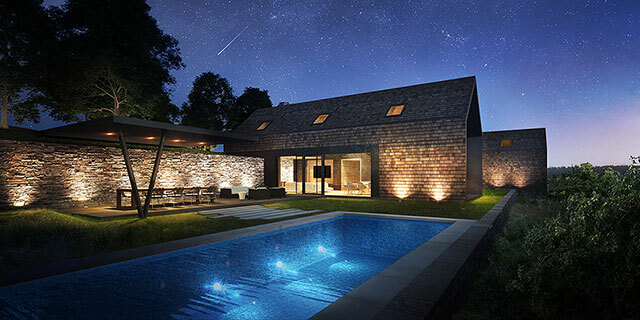 This is the final rendering of a family home in the Kociánka neighbourhood. Villa Moises is already housing its residents and we wish its owners will spend many beautiful moments in there. 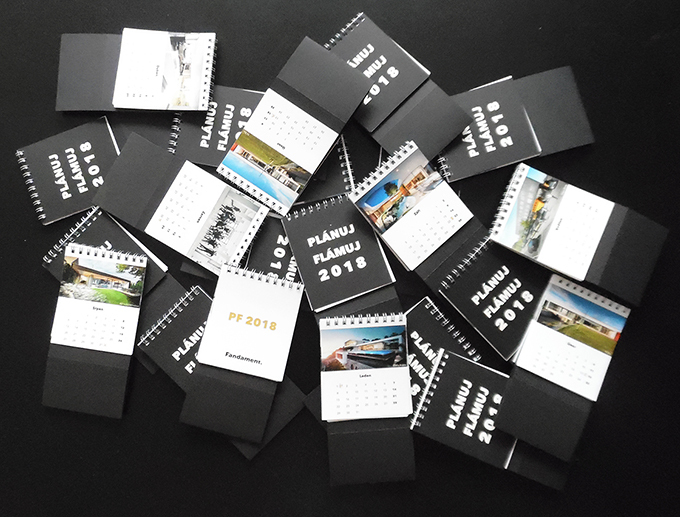 This year we were thinking practical and designed a small table calendar. 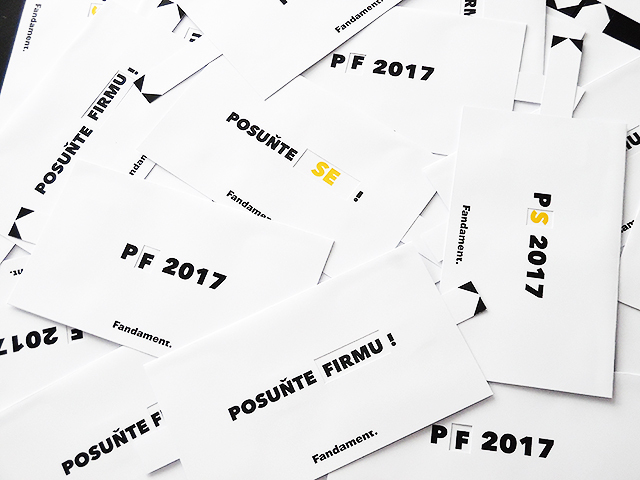 Plan your next year. And remember also enjoying it! 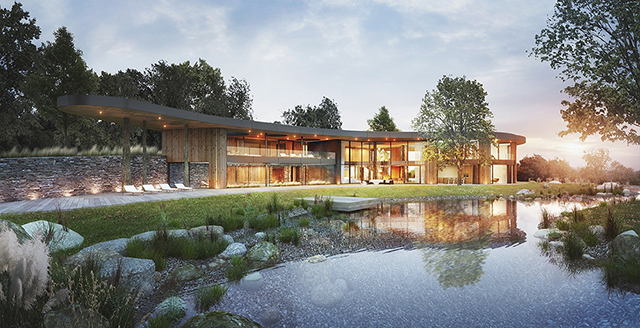 It was a pleasure to prepare the design of an exclusive villa on a land plot overseeing the Brno reservoir and the Svratka river valley. 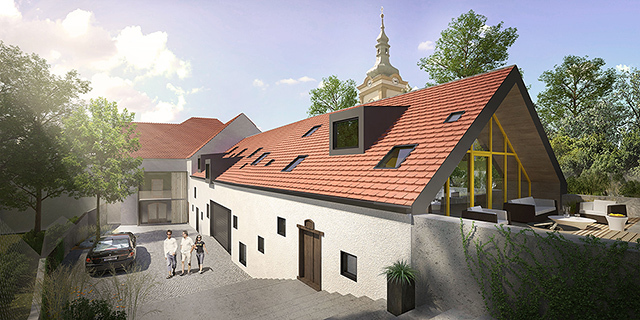 We are reconstructing a historical rectory building in Loučná nad Desnou. The mission is to keep the genius loci of the building and add modern structures and features. To be completed in the spring. Another well-done model. This time a family home in the Kociánka district. Idyllic life beyond the city reach. 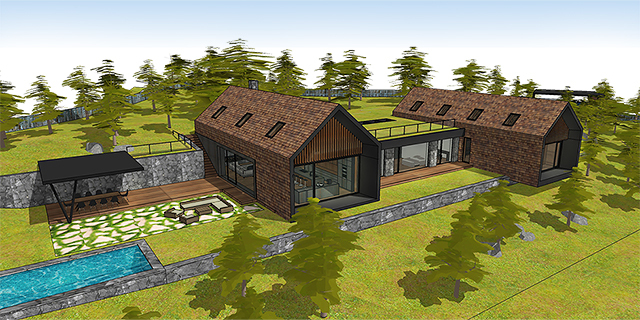 We completed the study of a chalet in the Křivoklát region. Karlova 933/ 7, 614 00 Brno. Our invoicing details remain the same for now. An endlessly long house with endlessly deep excavations. Those are the characteristics of our new construction. We have begun to build Villa RM34. We are finishing a study of a beautiful family home. With an atrium of course. An atrium more like a generous window overlooking the garden and further on towards the woods. 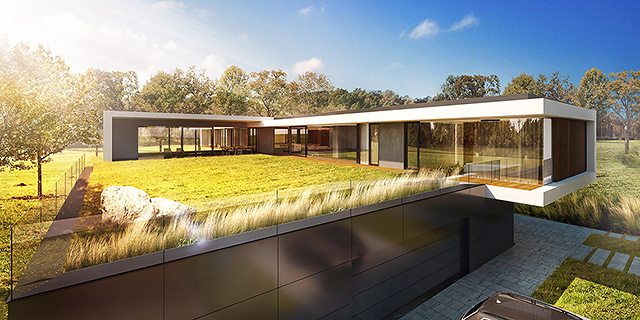 The shape of the atrium and the positioning of the skylights lets in the south-west afternoon sun that would otherwise, due to the position of the property, never come into the house. Out in the open, standing alone in the Krivoklat nature. The assignment was clear. A gabled roof, a massive wooden construction, evoking an Alpine chalet. Chalet Krivoklat. An article about the interior of a family home near Prostejov can be read on the ASB.sk website. The link can be found in our Media section. 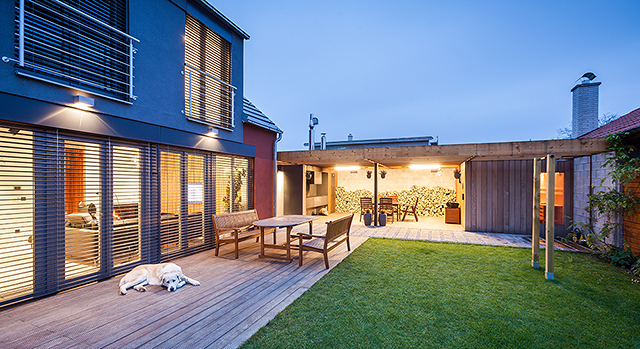 Our Villa with a View was ranked 2nd place in the Competition Stavba JMK 2015 in the category of housing construction. We are happy that our hard work was appreciated. Thank you! 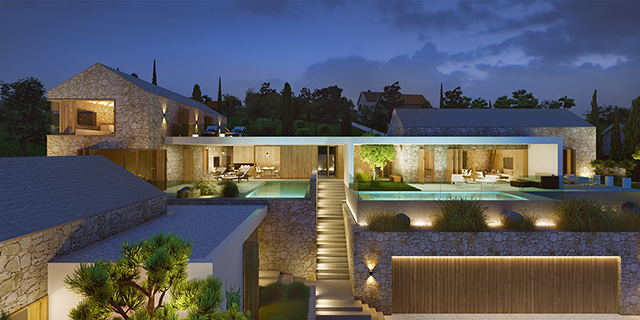 A foreign investor asked us to work on a concept of a villa with four apartments. Our project combines elegance with functional regular layouts and unique outdoor terraces offering exclusive views of the surroundings. We have finished the study of a family home in Uhersky Brod. 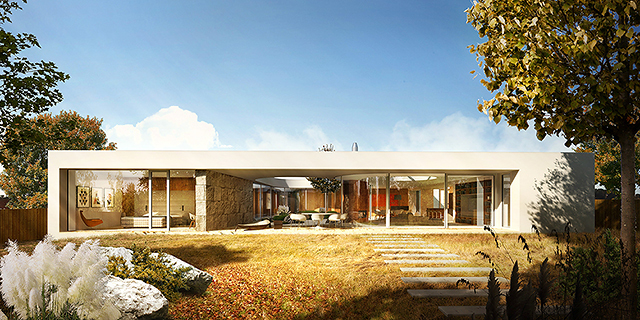 The house is based on an original vision of our client, who admires Brazilian architecture. 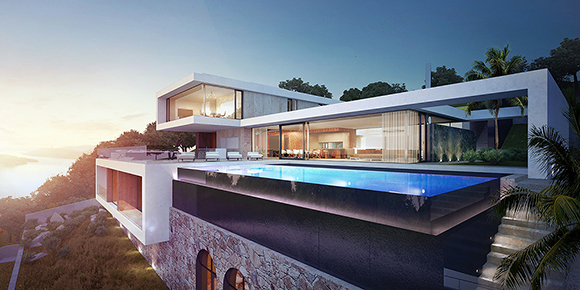 The main concept of the house is a dialogue between two masses – a rounded part with the living premises and a paned lounge and a bedroom, connected with the distinctive line of the roof overhang. 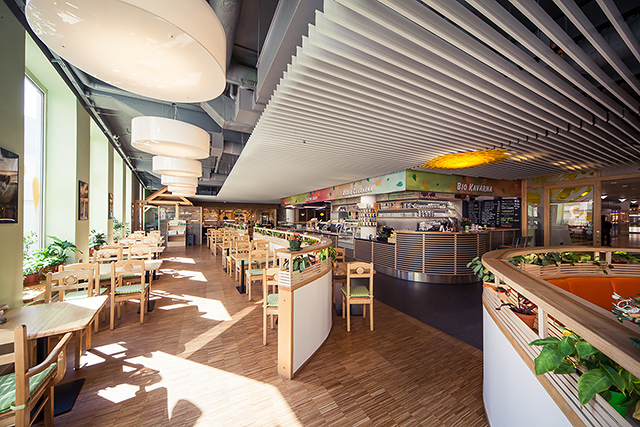 We photographed the realisation of the interior of the Rebio restaurant in Spalicek, Brno. A new feature is a “Gastro bar” where your food is prepared right before your eyes. The only restaurant of this type in Europe, it is conceived in accordance with Feng Shui principles. 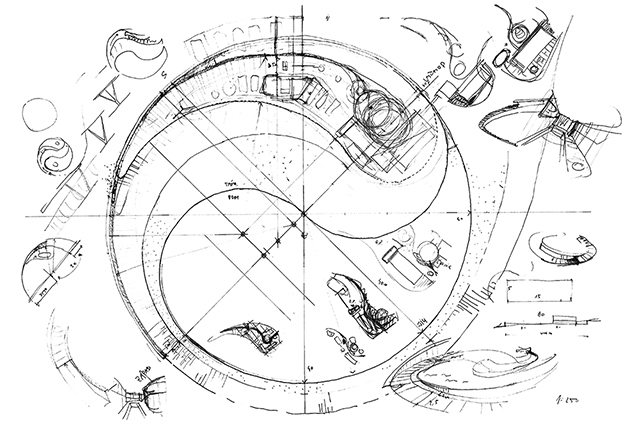 The inner layout is dominated by rounded shapes that allow energy to freely flow. 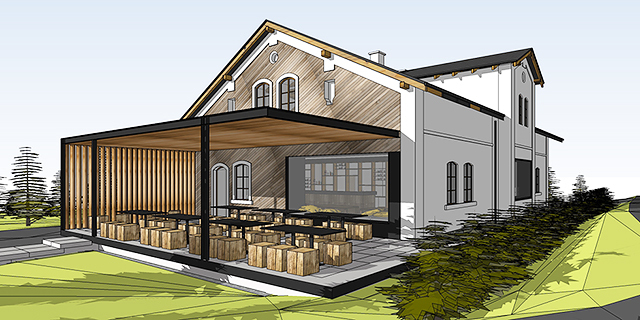 We have finished the study of a reconstruction of a historical building in Slapanice. The project preserves the original use of the historically and aesthetically valuable building of the old parsonage and the farm wing. We designed this showroom of the production area for a company based in the Jihomoravsky region. 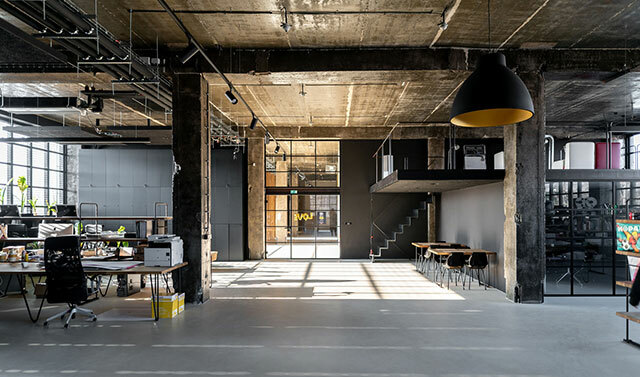 The firm connection between the company’s history and tradition and the strict order of the technologies used is present throughout the space, resembling an art gallery. The presentation of the products evokes museum exhibits. 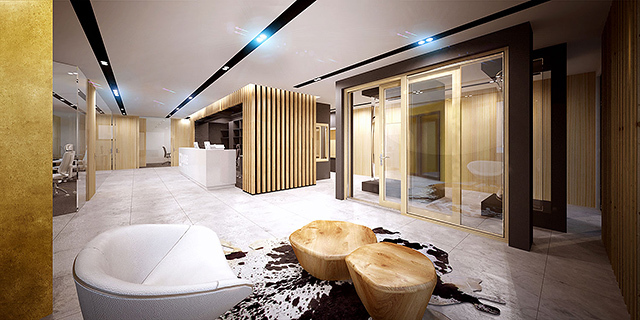 We finished the architectonic study of presentation and office premises in Rajhrad, Brno for the supplier of euro windows DARE. In a row of houses near Prostejov we designed the interior and external adjustments of a newly-built family home that was in the phase of rough construction. The concept is based on simple materials and moderation. Natural colours and materials in combination with white and light shades give the building an almost supernatural lightness. 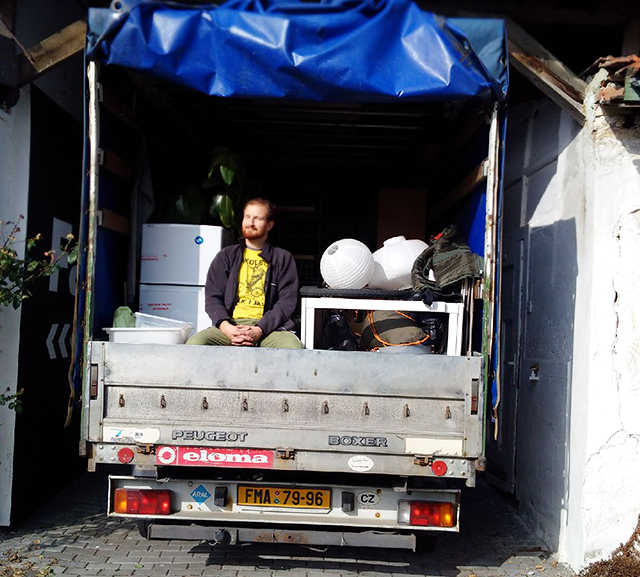 We have recently been working on the project of the family home Moises on Kocianka. We entered the project in the phase of an already standing rough construction. We have finished with the documentation for the demolition works and we are currently choosing a supplier. An evidently complex assignment transformed into an interesting and non-traditional project. 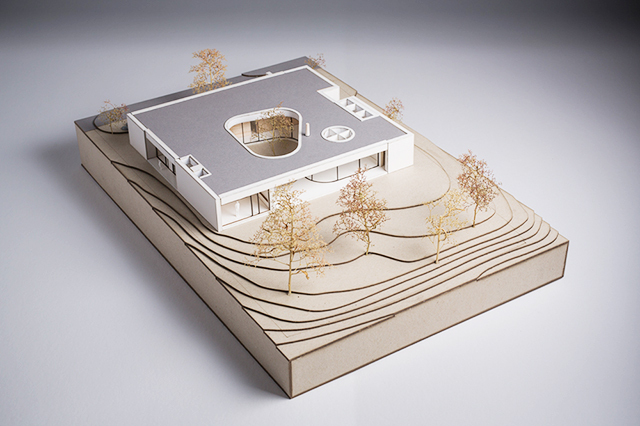 We have finished the study of a villa near Brno. The concept of bent cardboard delimits the main mass of the building and envelops all the main functions designed into the house. 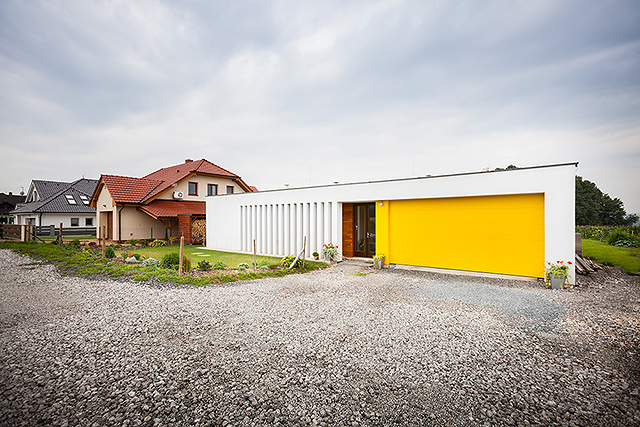 We have finally finished and photographed the construction of a family home in Ostrava, the Villa Atrium. The concept is based on a low tube open in the direction of the slope. The house features a characteristic use of materials that reflect the moods and emotions of the individual functions. 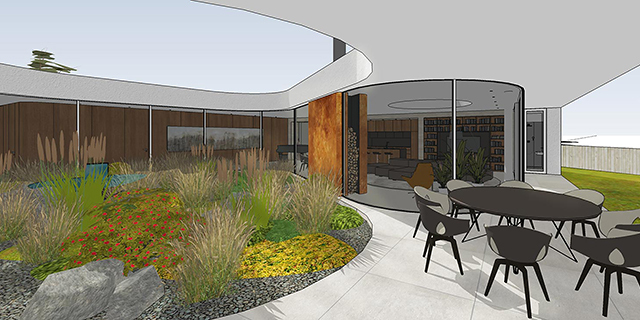 The volume of the atrium is cut out of the basic mass and provides a clear connection between the house and the surrounding nature. On Veveri Street in the centre of Brno you’ll find a newly-opened coffee shop and roasting house called Gill’s Coffee. You can taste coffee right on the spot. The main idea of the interior is a composition of three materials and elements: a compact single block of a bar, wooden floors and ceilings, and ceramic tiles.